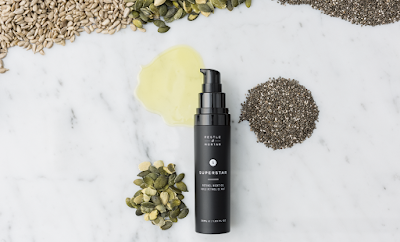 Product Claims: Repair and refresh your skin with Pestle & Mortar’s (P&M) Superstar, a luxurious retinol night oil made in Ireland. Infused with two types of retinol and blended with a base of cold pressed grape seed oil your skin will soak up Superstar, reducing pore size, tightening the skin whilst improving elasticity. Formulated to be lightweight and quick-absorbing this luxurious retinol night oil will leave your skin hydrated, glowing and rejuvenated. 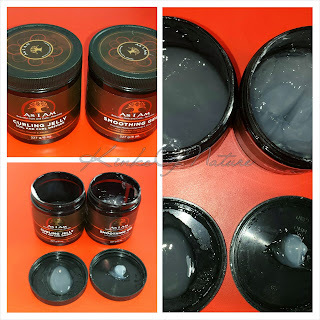 Superstar is non-irritating so no peeling dryness or redness! Pestle & Mortar Superstar retinol night oil is 100% free of animal derived raw materials and organic solvent remnants, paraben free, propylene glycol free, fragrance free and not tested on animals. Formulated to suit all skin types. Ingredients: Vitis Vinifera (Grape) Seed Oil*, Simmondsia Chinensis (Jojoba) Seed Oil*, Persea Gratissima (Avocado) Oil*, Rosa Canina (Fruit) Oil*, Punica Granatum (Pomegranate) Seed Oil**, Ribes Nigrum (Black Currant) Oil*, Hydroxypinacolone Retinoate, Retinyl Palmitate, Daucus Carota Sativa (Carrot) Seed Oil***, Nigella Sativa (Black Cumin) Seed Oil**, Calophyllum Inophyllum (Tamanu/Foraha) Seed Oil**, Vaccinium Macrocarpon (Cranberry) Seed Oil*, Dimethyl Isosorbide, Tocopherol, Calendula Officinalis Flower Oil**, Caprylic/Capric Triglyceride, Helianthus Annuus (Sunflower) Seed Oil**. Review: This is the second retinol oil I've tried with the active ingredient hydroxypinacolone retinoate. In fact, this oil also contains retinyl palmitate. I decided to try this oil after noticing it has similar ingredients to Sunday Riley (SR) Luna but with a lower price point. Hydroxypinacolone Retinoate (HPR) is an ester of retinoic acid. HPR binds directly to retinoic acid receptors without being coverted, unlike retinol and other derivatives that must first be broken down to retionoic acid. More information on this ingredient and it's properties can be found on the International Dermal Institute's page. Overall, P&M Superstar is a nice oil and kept dry patches at bay. However, ultimately I don't think Superstar was as effective as Luna for me. With Luna, my skin cleared up quicker, had a faster turnover. With Superstar, I just didn't get the same effect. Looking more at the ingredients, Dimethyl Isosorbide is supposed to help with the penetration of active ingredients. I wonder if Luna was more effective because it has Dimethyl Isosorbide (And) Hydroxypinacolone Retinoate combined in their formulation. In Superstar, Dimethyl Isosorbide is towards the end of the ingredients list. That's just my guess. I am curious about others' experiences using both and which one performed better. There's no discernible fragrance with this oil, so it really depends on personal preference as to whether this affects usage. The 1oz P&M Superstar lasted me only 6 months, whereas SR Luna 0.5oz/15ml last 6 months. I'm a bit disappointed by this. I used 1 pump of Superstar nightly, so it's not that I was excessively applying it. I assumed it would last longer than SR considering it's double the size. One thing I absolutely love about P&M is the great packaging and attention to detail. My order arrived in a securely packaged box, with a P&M branded gift bag inside. The bag included sample the other products in the line. I am already planning to purchase the full size of Renew Gel Cleanser. It was literally love at first wash! P&M retails for £65 on the Pestle & Mortar site. They have a US-based site as well. Would I repurchase? No. I think this oil would be better suited for someone with more sensitive skin. It's quite gentle and could be beneficial in the long run.